Perhaps it is the winter chill in the air or maybe it is the less romantic side of the upcoming holidays – carrying bags full of presents through crowded shops – that works up an appetite for a hearty meal? Absolutely famished from a recent shopping excursion, I decided to get some “comfort” from The Cheesecake Factory at Park Meadows Retail Resort. Known for its generous portions, extensive menu, and legendary desserts, The Cheesecake Factory’s humble beginnings started in Michigan in 1949 in the home of Evelyn and Oscar Overton. Driven by the couple’s dream of someday owning a family business, Evelyn found a recipe in the local newspaper that inspired her to create an original cheesecake recipe that would be loved by all. The couple converted their basement to a kitchen and supplied Evelyn’s cheesecakes to some of the best restaurants in Detroit, all the while raising their family. In 1972 with their children grown, the Overtons moved to California to open a small bakery in Los Angeles. They called the bakery The Cheesecake Factory. Six short years later, with little knowledge of how to run a full scale restaurant but a desire to showcase his mother’s selection of cheesecakes, their son David opened The Cheesecake Factory restaurant in Beverly Hills. “The Overton’s son, David, is the current owner of The Cheesecake Factory restaurants,” said manager of the Park Meadows location Marie Kaufman proudly. “We have 192 locations in operation. 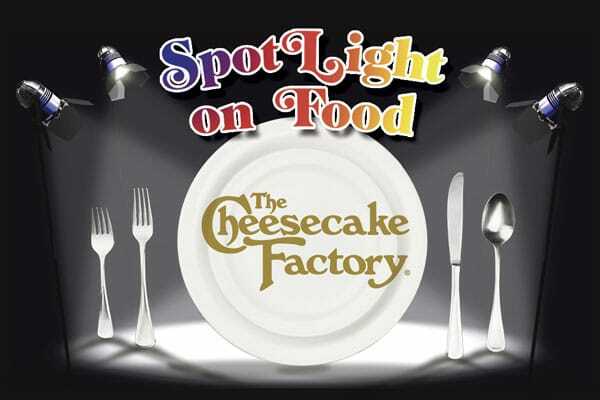 Along with the four locations in Colorado, The Cheesecake Factory brand has expanded all around the world. We’re even in places like Puerto Rico, Saudi Arabia, and Dubai and we are looking to soon expand to Hong Kong,” she added. I joined the eager masses and added my name to the waiting list. “It’s been really steady with the holidays getting closer,” Kaufman said. “We were prepared for it to be busy, but not as busy as we are.” However, waiting turned out to be a good thing since it gave me time to ogle the variety of cheesecakes in the display case for sale (whole or by the slice), pondering the idea of just having cheesecake for lunch. After being seated, my chipper waitress Lisa brought fresh bread and butter to the table and presented me with three separate menus – this decision wouldn’t be a quick one. While I enjoyed a fruity sangria to ease my shopping stress, I secretly smirked at the new low calorie “skinny” menu and ordered Portabella, Avocado and Zucchini Fries. 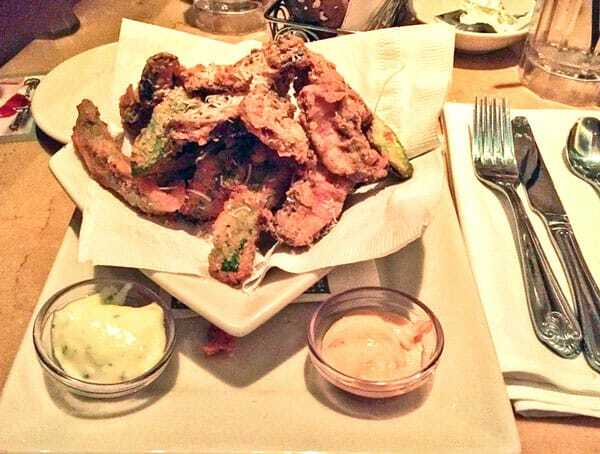 The mushrooms, generous slices of zucchini, and pieces of avocado were lightly breaded and fried, and steam came off each crunchy bite. The garlic aioli and chipotle mayo sauces were creamy, tangy and had a pinch of spice. I could have easily filled up on the appetizer. 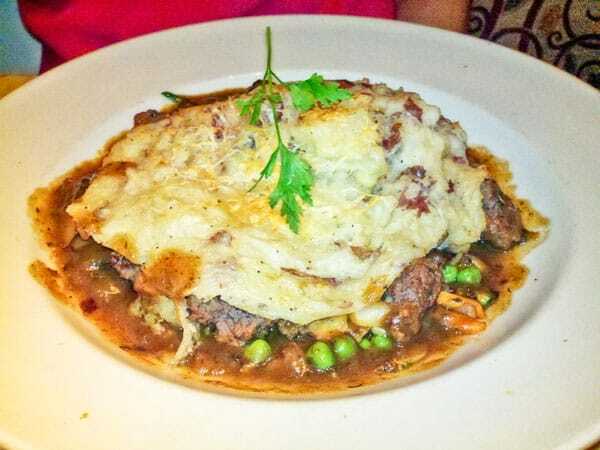 Remembering Kaufman’s remark that the meatloaf, White Chicken Chili, and Shepherd’s Pie top the list of things that are currently ordered because this time of year people seem to focus more on the “comfort food” dishes, I ordered the lunch portion of the Famous Factory Meatloaf – hoping that it had gained its popularity from its taste. When my meal arrived, I quickly understood why it was a frequently ordered item. 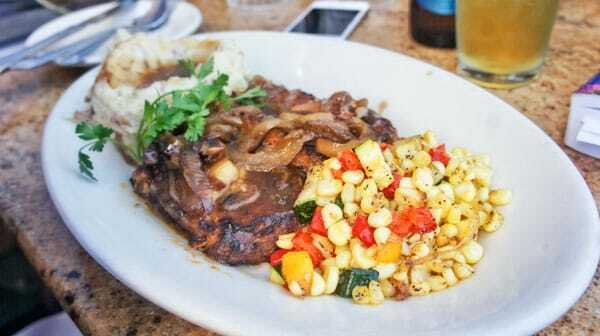 The meatloaf had a sweet, buttery taste like grandma made it in the kitchen. On the side came corn mixed with bits of veggies and a healthy portion of delicious mashed potatoes (just the way I like them, with the skin left on the potatoes!). Although I had zero room and was taking much of my remaining food to go, I knew it would be breaking protocol to leave the premises without sampling one of the 35+ cheesecake flavors. I chose the gluten free Flourless Godiva Chocolate Cheesecake to enjoy “later” – which turned out to be in my car after I made the mistake of opening it to have a peek. I savored every bite. 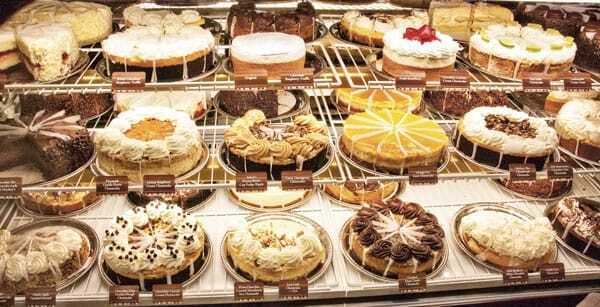 The Cheesecake Factory has secured a portion of the restaurant world’s proverbial pie. Young and old, there truly is something for everyone.